Potty Training is EXHAUSTING when you are very pregnant! This is Julie again. I will admit up front that potty training is not my forte! Gwen seemed more ready to me than all the others but soon after we got going I started to reevaluate. Stubborn is not even the word. Although she loves fun fruits it was not a motivator! Stickers/treats whatever! I couldn’t quite find out what motivated the pipsqueak. I now think just being big is what motivates her! Week one I literally sat upstairs with her every day–all day (I’m not joking). 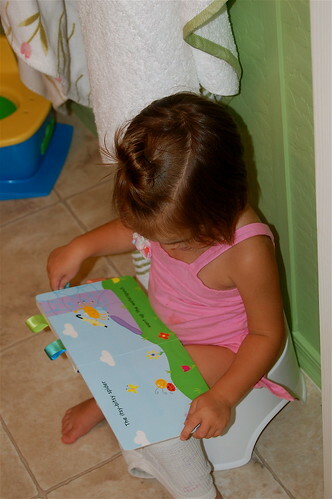 I would often fall asleep in the doorway of the bathroom while she’d read stacks of books. I found out real quick this kid’s a camel and has an unbelievable ability to store/hold peep (even forcing liquids). After a few successes and many mishaps I was thinking I was ready to throw the towel in last Sunday! When I went to put a diaper on her she was ecstatic and over the top! I couldn’t do it–I decided we had tried too hard and we were going to BRAVE THE STORM! While things are not perfect and we still have occasional accidents she has picked it up and we are entering week 3! I am too exhausted to write much more about this potty training experience but here are some pictures of the newest underwear-clad member of our family. Way to go Gwenyth! Spent loads of time doing this! I feel your pain, potty training is tough work! Eli was 4.5 when he finally did it. One thing that worked for us,and I actually use this for lots of things, is beads. I buy a bucket of beads and the kids get them for good behavior or whatever else I am trying to get them to master. Ethan earns a bead if he does homework without complaining and if he wakes up and gets dressed without being asked. Eli gets a bead if he goes to the bathroom without us having to be in the bathroom (he’s still trying to hang on to some control) and for overall good behavior. They can redeem the beads for various things. The boys usually have something in mind that they are working towards. I string the beads on twine and hang it in their room somewhere. I swear by this reward system! It totally works for my boys. Good luck with the adventure. It will all click eventually. Ahhh… we just potty trained Zack 2 weeks ago. I waited with him and it went quick. I thought we did it, only a few accidents on the way to the toliet running. But today we had one of those poo in a store, running down his legs- no wipes, carrying a baby… you get the picture. But at least I’m not pregnant doing it. I remember those days. Julie- Please come and help me do my house. I’m not kidding. I’ve always loved your style. I’ll pay you just for your ideas! Isn’t potty training the worst. I’ve ony done it once and once was enough. Please tell me it gets better. I can’t believe Gwen is already that grown up. Way to go! Love the blue dresses btw. Bravo and just before you have to buy more diapers!! That is amazing. But I can top that. I had twins twice and had a single baby. That is five babies, and potty trained the two sets of twins together in about 2 weeks.